A Must For All Lovers of Film But Why “The Searchers”? 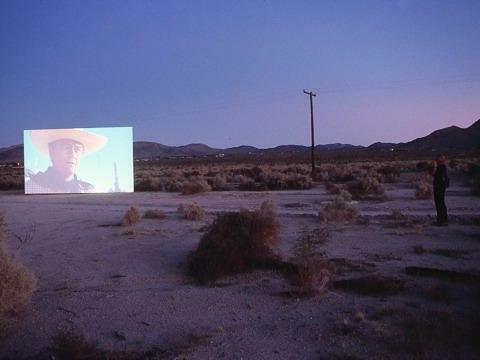 The installation was the brainchild of a guy called Douglas Gordon whose aim was to project the complete version of The Searchers onto a screen positioned not far from the main highway, but with a projection time of approximately 1 frame every 15 minutes as opposed to the standard 24 frames a second. Gordon estimated it would take about 5 years for the film to run from the very first to the very last frame – which is the time it takes in the film for Ethan Edwards (John Wayne) to track down his kidnapped niece, Debbie (Natalie Wood). A few years before this Gordon did something similar with his installation 24 Hour Psycho in which he expanded the running time of the Hitchcock classic over a 24 hour period. The question is, out of all the films Gordon could have chosen to project onto a screen in the middle of a desert, why The Searchers? The preface to the book quotes his childhood growing up in Scotland and watching Westerns with his dad on the tv. He is quoted as saying that he complained to his parents about the lack of pace and action in The Searchers, and they told him he would understand the film once he was older. For the so-called boomer generation, of which I am a fully paid up member, I think that’s really the key to it all. You need to watch the film quite a number of times over a long period – I first saw it in 1956 when I was four years old and I still watch it on a frequent basis – before you start to appreciate the complexity of The Searchers, as well as the realisation that it really is one of the best films ever to have come out of Hollywood, and certainly the finest of all the movies born out of the partnership of John Ford and John Wayne. Rather than preach to the converted out there, people of my age and maybe those of the generation that came afterwards, the question I would pose is how can I go about persuading my children’s generation that they should watch the film in the first place? In other words, why The Searchers and not Citizen Kane / Vertigo / Sunrise / Seven Samurai / Breathless or any other film that constantly appear in best film polls. If I were faced with an audience in their late teens / early 20s to whom I would be tasked with making the case for The Searchers then I would ask them to consider three key elements of the film itself. So here’s the first problem. The Searchers is a cowboy film. And it’s got John Wayne in it. Let’s deal with the fact it’s a Western first. To be brutally honest, the Western genre is moribund, to say the least. It’s crawling around somewhere out there in the dust and tumbleweeds, shot full of arrows and barely able to move, the spark of life reignited with the occasional injection of a Dances with Wolves, Unforgiven or Deadwood to indicate it has not yet totally ceased to exist. Of course elements of the Western can still be detected in one form or another – whether it ‘s Star Wars, Assault on Precinct 13 (based on Rio Bravo), Outlander (1981 sci-fi thriller based on High Noon), Serenity (Stagecoach by any other name) – the list goes on. The presence of John Wayne, however, could be considered to be a bit more problematic for a contemporary audience. Here’s an actor whose screen character is interchangeable with his off-screen persona. Wayne still stands for old-fashioned American values, values that have gone out of favour with many people, including Americans themselves in these more cynical times. Being honest, God-fearing and consuming large amounts of mom’s apple pie just doesn’t cut it any more and Wayne personifies those outmoded morals in spades. The point that needs to be made, however, is that when it comes to The Searchers you’re not being presented with the steadfast, upright, morally correct individual that Wayne is usually associated with. I can’t think of any other John Wayne film made either before or after The Searchers in which he a) shoots three men in the back, b) shoots out the eyes of a dead Comanche warrior, c) mutilates the corpse of another dead Comanche and d) attempts to murder one of his own relatives. Admittedly he’s quite vicious in Red River, which was made about 8 years before, and he can be mean and ornery in some of his later roles in The Cowboys, True Grit and The Shootist but in those films he still embodies the characteristics that define the John Wayne we’re all familiar with. 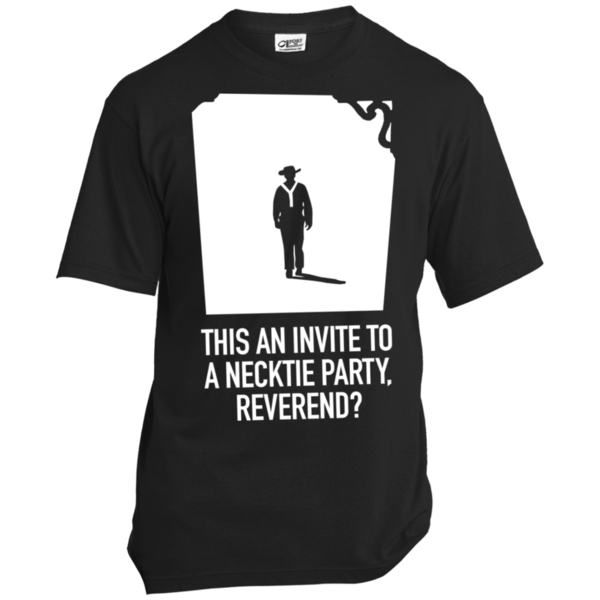 Even in The Searchers there are occasions when he can’t help being John Wayne – ‘This an invite to a necktie party, Reverend?’, ‘That’ll be the day’ etc – but the character of Ethan Edwards transcends those clichés. He’s a snarling, angry, bigoted racist who wants to put a bullet into Debbie’s brain because she had the temerity to be kidnaped and thus tainted by association with the tribe that took her away. She is no longer acceptable in white society so has to be eliminated. 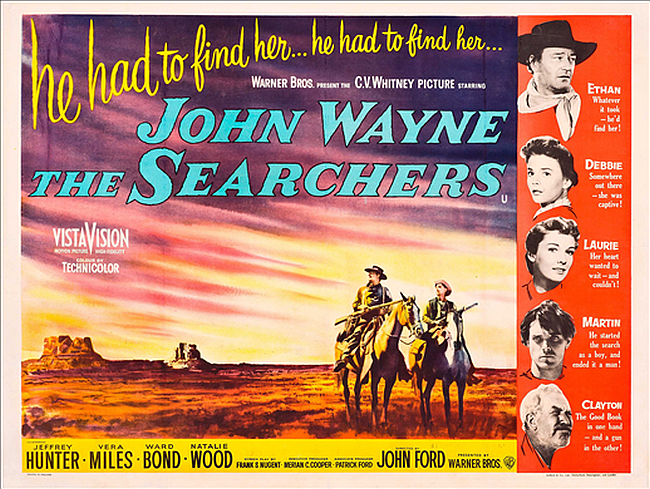 Ethan Edwards is up for the job and that’s what makes The Searchers unique in John Wayne’s acting CV. Wayne is simply at his career best here and even though Ethan doesn’t carry through with his threat to kill Debbie – a scene that continues to make the hair stand up on the back of my neck no matter how many times I watch it – this is still a film everyone should see for themselves, even if Wayne’s presence may initially be off-putting for the audience of today. 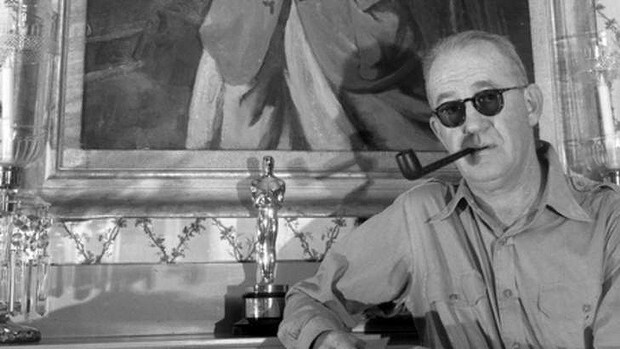 I could write a hundred thousand words on the subject of John Ford and still do not do him justice, so I’ll just stick to the issue in hand. Ford is obviously known for his Westerns, even though the majority of the films he made in that genre were actually produced during the silent era. He made his first sound Western, Stagecoach, in 1939 and along the way helped elevate Wayne to star status. In my humble opinion nearly all of the Westerns Ford directed from 1939 onwards qualify for classic status, apart from the occasional box-office misfire such as Two Rode Together, which is almost a virtual remake of The Searchers. For me, one of the aspects of The Searchers that sets it apart from the cowboy films Ford made prior to this is the way in which he depicts the plight of Native Americans. I feel this is the real turning point in the director’s onscreen attitude towards America’s indigenous natives. Some of the images from the sequence in which Ethan Edwards and Martin Pawley (Jeffrey hunter) chance upon a Comanche village that has been devastated by the cavalry bears comparison with some of the late 60s / early 70s liberal Westerns such as Soldier Blue and Little Big Man. This is Ford finally questioning the role of the military in ‘settling’ the West and he doesn’t pull any punches. The cavalry regiment that arrives in the nick of time at the end of Stagecoach, flags flying gloriously in the wind, is now transformed into a ruthless band of cutthroats who kill those that came before them. I would therefore argue that The Searchers is indicative of a real turning point in the life of Ford himself, with particular regards to his own attitude towards the plight of the Native Americans, and it’s up there on the big screen for all to see. 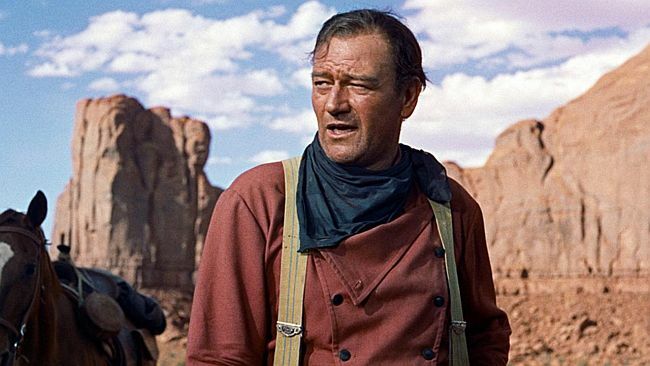 By the time Ford made his last Western, Cheyenne Autumn, in 1963, the Native Americans are no longer depicted as ciphers or silhouettes on the horizon. They are shown as real people with real lives and emotions, the characters in the film elevated in the storyline and sharing equal screen time with the white protagonists. Ford made a lot of other films that were deemed to be close to his heart, such as The Quiet Man, They Were Expendable and The Wings of Eagles but for me The Searchers is about as personal as it gets. As an aside to the question of the settling of the West as referenced in The Searchers, one of the essays in the book mentioned at the beginning of this article raises an intriguing point regarding the Comanche raid on the home of Ethan’s brother. The author of the essay, Tom Grayson Colonnese, is a Native American himself and he calls the siege on the cabin a counterattack against those who had themselves earlier appropriated the land by force. This doesn’t take into account of course the fact that whoever lived there before the settlers arrived had also probably done exactly the same thing, but it’s a worthy point of discussion. Where would the Western be without Monument Valley? The silhouettes of the towering buttes and the dark orange of the desert have come to personify the cowboy film over the years since Ford first went there to film Stagecoach. It’s almost cinematic shorthand for depicting the West. Marty McFly lands smack in the middle of it in Back to the Future 3, and Sergio Leone cheekily hijacked the spectacular setting for his Western, Once Upon a Time in the West. The Marlboro man poses in front of a backdrop to the valley, and Wile E. Coyote is forever chasing the Road Runner in and out of a landscape closely modelled on Ford’s favourite location. 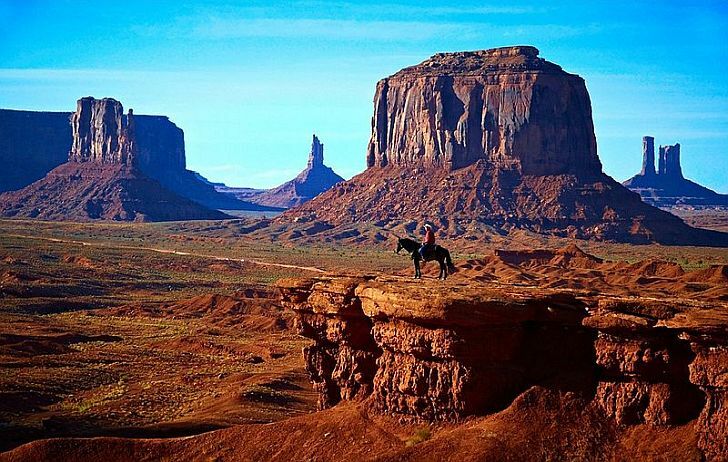 It is in The Searchers, however, that for the first time Monument Valley is as much a character in the film as it is a backdrop to the action that plays out against the wilderness of the terrain. The landscape hides the marauding Native Americans just before they snake along the slopes surrounding Ethan and his search party. The valley then reduces the size of the individuals in pursuit of Debbie until they are rendered almost invisible to the naked eye by a backdrop that has not changed in millions of years, and will remain in place long after Ethan and his compatriots have turned to dust. 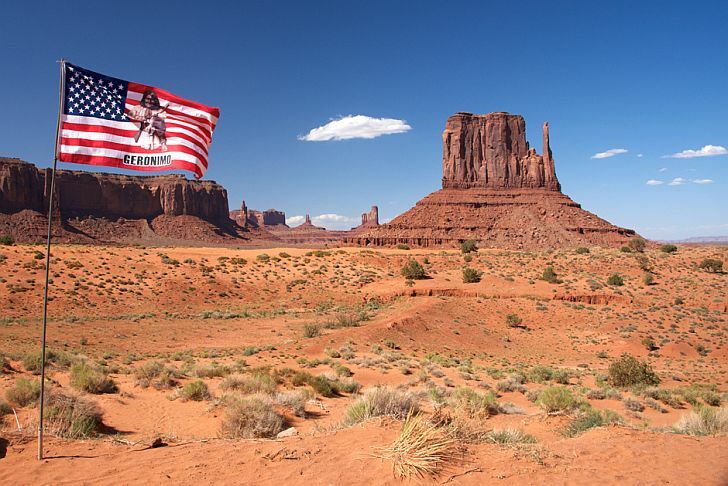 Ford comes close to equating Monument Valley as character in the earlier She Wore a Yellow Ribbon but it is in The Searchers that the director perfectly encapsulates the isolation and unforgiving savagery of the wilderness as exemplified by the location itself. So there you have it. A short defence of a film that should be seen by all serious lovers of film no matter what age, gender or ethnic background you may come from. For me I love John Wayne’s movies, but my favorite is The Searchers. He is one of the best actors to ever come out of Hollywood and there will never be another actor like him again. The Searchers – awesome! Thanks Diana.